East Asia is becoming increasingly important to the E.U. 's external relations. Trade with East Asia accounts for over a quarter of total E.U. trade, so the E.U. is keen to maintain regional stability there. The 2007 strategy paper by the Council of the European Union emphasized the E.U. 's interests in the region and highlighted guidelines for E.U. foreign and security policy. Yet when compared to U.S. foreign policy in East Asia, the E.U. 's is incoherent, much less active and more loosely defined. To turn the E.U. into an active actor in East Asia remains a challenge, and serious efforts will be needed if it is to achieve substantial results. The first E.U. Asia policy paper, Towards a New Asia Strategy, came out in 1994, when the success in creating a single market within the E.U. had encouraged it to tackle markets abroad. The economic achievements at that time of Japan, the four Asian tigers (Singapore, Malaysia, South Korea and Taiwan) and China's drive toward far-ranging economic reform prompted Europe to pursue ambitious ideas for economic cooperation with these countries. The inter-regional Asia-Europe Meeting (A.S.E.M.) cooperation framework established in 1996 created a platform of direct dialogue and communication between leaders from both continents. The member list of A.S.E.M. has since grown to 45. Nobody today needs telling that East Asia is the most dynamic region in the world. 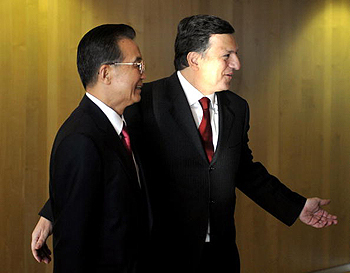 And largely as a result of China's rise, geopolitical relations in the region are being redefined. Japan used to be the leader of the multi-tier hierarchical "flying geese" model of regional development, but that was before it suffered its "lost decade" of economic depression. The relationship between the U.S. and China has gradually changed from conflict over ideology and of differing political stances in international relations to one of competitors yet partners who have learned to defend each other's interests through cooperation instead of confrontation. The decision by U.S. Secretary of State Hillary Clinton to make East Asia her first official visit sent a message to the world that she saw the region as crucial to U.S. foreign policy. The E.U. is much less involved in East Asian regional affairs, with its cooperation on foreign and security policy to a large extent only on paper. France's withdrawal from Vietnam in the mid-1950's in the wake of British and Dutch decolonization in the region saw European influence there dwindle rapidly. Then in the Cold War era, the U.S. concluded treaties with most countries in East Asia as it sought to set the terms of regional peace and stability. The European Security Strategy of 2003, along with last December's review of its implementation, marked the E.U. 's present effort to develop towards becoming a world power. But despite its rising global ambitions, the E.U. 's capacity to do so remains in serious doubt. Compared with U.S. influence worldwide and the rising economic and military power of China, the E.U. is widely seen as the epitome of soft power. Attaching, as it does, great importance to democracy, the rule of law and respect for human rights, the E.U. acts as a guardian of these values. These are important conditions for would-be E.U. members to espouse, but its lack of hard power means that the E.U. 's capacity to influence other regions is rather limited. In other words, the E.U. has a weakness in terms of its international relations. Until it has an effective foreign and security policy, the E.U. will be an underdeveloped power and will have problems when seeking to exert power and influence in East Asia. The United States, by contrast, remains a significant external power with strong military forces deployed in Japan and South Korea, two countries that have been close allies since the end of World War II. The U.S. is a major actor in the ongoing North Korean nuclear crisis, thanks to its 25,000 soldiers in South Korea. In China-Taiwan relations, the U.S. plays an essential role because of its Taiwan Relations Act and the strong naval presence of its aircraft carriers in the Pacific. The U.S. influence in ASEAN countries is also undeniable. If the E.U. is to enhance its influence in East Asia, it has to develop a more effective diplomatic and security policy. One problem is how to overcome internal differences and achieve consensus among its member states in the making of East Asia policy. Its 27 member states need to find a better balance between the overall E.U. interest and their individual national interests. The E.U. also needs to strengthen its relations with major actors in the region, not only in economic cooperation and trade relations but also in military exchanges. The dialogue between the E.U. and East Asian countries should include military cooperation. As to North Korea's nuclear program, the E.U. should strengthen communication with the other five members in the framework of six-party talks and try to strengthen direct contact with North Korea. North Korea is greatly in need of capital and technology, so the E.U. might become its ideal partner. E.U. economic cooperation with North Korea could help encourage the latter to be more cooperative in its relations with the outside world, and thus lead eventually to its complete nuclear disarmament. South Korea is an indispensable actor in the six-party talks, and an enhanced E.U. relationship with South Korea would help strengthen Europe's influence in this major security issue. Last year’s E.U.-South Korea biennial summit meeting scheduled for October was canceled due to the "busy timetables" of French president Nicolas Sarkozy and his Korean counterpart Lee Myung-bak. The E.U. has for a long time had a close economic cooperation with Japan, but E.U.-Japan political cooperation is much less developed and needs to be deepened. With both parties deeply concerned over security and stability issues, the two should clearly strengthen their cooperation on global and regional conflict prevention, disarmament and non-proliferation. The E.U. could also play a special role in relations across the Taiwan Strait. Despite the fact that the E.U. established a strategic partnership with China, it still maintains the arms embargo against Beijing that it introduced in 1989, although E.U. member states are themselves divided over whether the embargo should be lifted. The E.U. tried to give serious thought to the issue five years ago, but pressure from the United States and China's introduction of its Anti-Secession law against Taiwanese independence made the issue more complicated than ever. The E.U. obviously wouldn't want to see weapons made in Europe being used against American soldiers, but it nevertheless needs to ensure that its partnership with China is not jeopardised by differences over the arms embargo. While requesting that China should make noticeable improvements in its human rights record, the E.U. should also develop consensus among its member states on their policy towards China. The scheduled E.U.-China summit at the end of last year was postponed due to President Sarkozy's planned meeting with the Dalai Lama. Although that was in his capacity as France's head of state, he was at that time also president of the Council of the European Union, so this incident affected E.U.-China relations negatively. This makes it more necessary than ever for the E.U. to develop a joint policy on China that all its member states would implement, thus ensuring that in the future overall E.U.-China relations would not be affected by the behavior of individual member states. Doing so would also help increase E.U. influence by reducing China's ability to exploit any situation where E.U. member states do not speak with one voice. Much has been written about this being the "Asian century." If it is genuinely to strengthen its role in East Asia, the E.U. must introduce changes that will guide it towards a new-style East Asia diplomatic and security policy. The E.U. must develop its actions from paper engagement to substantive engagement, from differences among the E.U. member states to consensus, from policy incoherence to policy coherence, and from individual action to joint action. This article was originally published by europesworld.org.